A short guide on where to find credit and capital. The USDA offers a number of credit services and is intended to be a “lender of last resort” (i.e., they fill in the gaps when traditional lenders—such as private banks—turn you down). Many of the USDA programs, especially those administered by the Farm Service Agency (FSA) are intended specifically for beginning farmers. These programs are funded via allocations from Congress; the allotments are dictated by the U.S. farm bill (which is why NYFC works so hard to represent beginning farmers in farm bill proceedings!). The Farm Credit System is a nation-wide network of borrower-owned lending institutions. Organizations in the network operate similarly to private banks; qualified applicants can receive loans farm ownership loans, operating loans (lines of credit), equipment financing and more, depending on the offerings of their local institution. Many programs also offer related programs, such as business consulting, crop insurance, tax services and financial record-keeping assistance. The regional organizations together provide nearly $200 billion in loans, leases, and related services to farmers, ranchers, and other related businesses. The System as a whole is overseen by a government agency, the Farm Credit Administration. More information on the Farm Credit System as a whole can be found here. 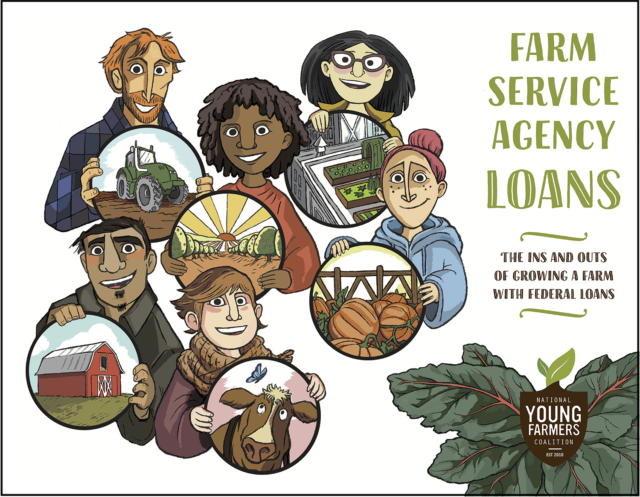 Some Farm Credit groups offer special “Young and Beginning Farmer” programs. Farm Credit Services of America, which provides service to Iowa, Nebraska, South Dakota and Wyoming, offers specialized real estate loans and operating loans for producers under the age of 35, with 10 years of experience or less. Farm Credit Services of America also gives “Youth in Agriculture” loans for livestock purchasing. More on FCSA can be found here. Farm Credit East, which services New Hampshire, Massachusetts, Connecticut, Rhode Island, New York and New Jersey, has a “FarmStart” program, which assists beginning farmers in their startup years by providing working capital investments of up to $50,000 to get their business off the ground. Information on Farm Credit East can be found here. Farm Credit East also provides other incentives for beginning farmers, such as accounting and tax preparation assistance. More information on those programs can be found here. The Farm Credit System covers all 50 states and US territories, and there is likely a branch office near you. You can find your closest Farm Credit affiliate office using this mapping tool. This is an incomplete list of nonprofit lenders and investment organizations. Know of another organization that should be on the list? Please let us know. The Carrot Project, a nonprofit based in Somerville, MA, works with farmers and lenders to create loan programs for beginning farmers that is connected to technical assistance. The project works in four geographic areas: Greater Berkshires (Western Massachusetts area), Maine, Massachusetts and Vermont. In each area, they work with a local private lender to develop loans for farmers and other food processing or distribution endeavors engaged in sustainable agriculture. Loan terms are between 1 and 7 years. Funds may be used for operating or capital expenses. Shade Fund is a joint project of The Conservation Fund and the U.S. Endowment for Forestry and Communities. The nonprofit provides small loans to green businesses entrepreneurs, including farm operators. More information is available here. US Businesses that engage in sustainable environmental practices are eligible to apply. More information on applying is available here. The ATTRA program includes an ongoing list of sustainable agriculture grant and funding opportunities from public and private sources around the country. Private lenders (i.e., banks) should be the first place to look for loans. Unfortunately, they are often unlikely to support farm loans, which is why USDA and other loan sources exist. If this traditional route does prove unhelpful, remember that the FSA and the Farm Credit Council, as well as other nonprofit organizations, can work with banking institutions. Also consider finding someone who will co-sign a loan (i.e., someone who trusts you and can provide the necessarily collateral). Private loans can range from short-term (i.e., one year or one growing season—these are generally considered to be operating loans or lines-of-credit), intermediate-term loans (generally seven years), or long-term (usually real estate mortgages). More information on types of loans is available on the fact sheet A Farmer’s Guide to Agricultural Credit, published by the University of Illinois. More tips on how to apply are available from this fact sheet from LandLink Vermont. There are dozens of investment firms out there that focus on investing in sustainable farms. This is an incomplete list—if you know of something that should be added to it, please let us know. Vilicus Partners invests in organic farmers and farmland by linking socially-minded investors with organic farmers seeking affordable access to farmland. New Spirit is a partnership that connects investors with farmers who focus on organic land stewardship. They work with both farmers looking to purchase new land and with those developing land succession plans. More and more farmers and food entrepreneurs are looking to the crowd-sourcing models for building the capital needed for their business. Although some tout crowd-sourcing as a new concept developed to sidestep traditional lending, it relies on concepts that pre-date the entire banking industry: the idea a person can rely on their community for support with an endeavor. Kiva Zip is a person-to-person micro-lending program. Its goal is to expand loan access to entrepreneurs who are otherwise unable to obtain loans, either because they don’t qualify or the loan amounts are too small for traditional lenders. Currently Kiva Zip borrowers pay 0% interest rates. Kickstarter is a crowdsource funding platform where you can develop the idea for a project, publish it, and others can choose to donate it. There are dozens of similar services out there, but Kickstarter is one of the largest. Projects that do not reach their funding goals are not awarded any funds. Like Kickstarter, Indiegogo is a crowdsource funding platform where you develop a pitch, publish it, and investors can choose to donate to your endeavor. Indiegogo is free to publish, although it takes a percentage-based fee. Fundable is a crowdsourcing funding platform dedicated only to business entrepreneurs. Projects can be set up either as a “rewards” system (donors are given a gift in exchange for a donation) or as an “equity” set-up, where donors are given a share in the business. Fundable charges a flat monthly fee for fundraising projects, but does not take a percentage. Most states have state agricultural finance programs, similar to the programs offered by the USDA. Use this directory from the National Council of State Agricultural Finance Programs to learn more about what your state has to offer. These programs include “Aggie Bonds” (loans for beginning farmers), guaranteed loan programs, direct loan programs and loan participation programs (where the state agency purchases a portion of the loan from the lender). More in types of state loan programs is available here.